Supervisor Eugene A. Delgaudio (R-Sterling), a longtime opponent of gay rights, is coming under increased criticism for recent comments viewed as homophobic and embarrassing to the community. At a Board of Supervisors meeting Wednesday, five of his board counterparts used personal time to chastise the Sterling supervisor for anti-gay comments. One member, Andrea McGimsey (D-Potomac), apologized that Delgaudio made some of the remarks from the board dais. During Fire-Rescue portion of the FY16 budget meeting on 3/9/15, discussion came up by Supervisor Letourneau (South Riding) about the lack of Advanced EMS coverage during the day in Sterling (mp4 starting at 0:38). It was suggested that an additional career medic unit be added in Sterling to help alleviate the shortage of ALS care and those positions be added to the budget. Chairman York made a motion that the Board of Supervisors add $2,354,359 in local tax funding and 19.04 FTE to the Department of Fire, Rescue and Emergency Management for staffing needs related to the Heavy Rescue Squad and Advanced Life Support (ALS) unit. It was further moved that these resources not be used until the Chief of the Combined Fire Rescue System makes a recommendation to the Board concerning specific staffing needed by these volunteer companies. It was further moved to reduce the enhancements for the Purcellville Volunteer Company staffing by $108,680 to provide ten months funding and the Hybrid Staffing enhancement by $477,095 to provide six month funding. (Seconded by Supervisor Reid). The motion carried 7-1-1. (Delgaudio opposed, Higgins absent). The ALS FTEs(new positions) were added for a second career medic unit in Sterling to help with the heavy daytime call volume due to the lack of volunteer medics in Sterling during the day. It was the South Riding Supervisor that brought up the concern about the lack of medics in Sterling, not Sterling Supervisor Delgaudio. Delgaudio voted against adding those medic positions in Sterling to serve and protect the citizens there. 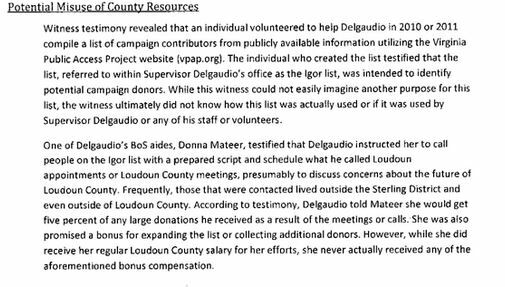 Again, this shows Delgaudio’s lack of care for his constituents.